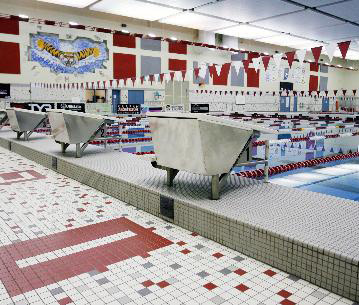 Fisher | ProMinent Fluid Controls, Inc.
Two medium pressure UV systems, each combined with a control system providing automatic setpoint control based on realtime pool water chemistry, have solved air quality issues for Indiana’s Fishers High School Pool. Poor air quality is not an uncommon problem at indoor aquatic facilities, and Indiana’s Fishers High School Natatorium was no exception. Like many natatoriums, the indoor facility battled undesirable chlorine by-products, or chloramines, that periodically produced poor air quality. However, with the recent installation of UV disinfection and smart control systems that can simultaneously modulate both chlorine dosing and UV power output based on real-time free and total chlorine levels in the pool water, combined chlorine and air-quality problems are no longer getting in the way of competition and training. The 10-lane, 50-meter competitive pool was built in 2006 and is used, on average, by more than 200 swimmers every day. In addition to the high school’s use, the pool is used by numerous other school swim teams and groups within the Hamilton Southeastern School District. During the aquatic center’s hours of operation, the two doors leading to the outside of the building sometimes remained open in an effort to dilute the air. The school district had been searching for a permanent solution to poor air quality after taking a number of steps to try to alleviate the issue, including a regimen of shocking the pool (superchlorination) as well as increasing the airflow inside the facility. The school’s swim coach, Jay Chambers, a 35-year coaching veteran and former ICGSA District Coach of the Year, concurs. Buddenbaum & Moore, LLC, one of the school district’s primary pool equipment suppliers, proposed, and the district ultimately decided on, the installation of two UV Series A medium-pressure UV generators and automated water chemistry controllers from ProMinent Fluid Controls. The two DCM 502 water chemistry controllers monitor and control pH, ORP, free chlorine and total chlorine. Sample streams are now pulled from the pool’s two main drains and then piped up through sample lines to the two separate controllers. The controllers use real-time free chlorine and combined chlorine measurements (in ppm) to control chlorine feed, and use combined chlorine readings to control secondary oxidizers, including UV. The ProMinent Series A UV system provides electronic power supplies with automatic set point control for efficiency at the lowest required power usage based on realtime water chemistry in the pool. The manufacturer estimates 40% power savings over conventional magnetic ballast systems, making power consumption closer to that of a low pressure UV system. In addition, the new UV system utilizes multiple control points, thereby providing for both a disinfection setpoint and a chloramine setpoint. This allows the DCM 502 control systems to run the facility’s UV systems at lower power for disinfection and to guard against cryptosporidium, and ramp up the power for chloramine destruction – modulating the UV power up or down as the real-time water chemistry in the pool dictates. The controller extrapolates the amount of chloramines in the water and can automatically turn on or turn up the UV to eradicate the chloramines. This eliminates the foul odor often associated with an indoor pool as well as the corrosion problems that excessive chloramines can bring. 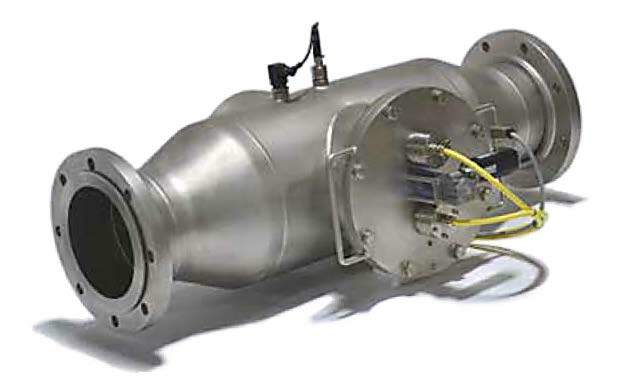 This function also can provide significant savings on both power and chemical costs. The UV dosage necessary to break down chloramines, 600 joules per meter squared (J/ m2), will also destroy approximately 20-35 percent of the “good” free available chlorine in the pool. However, 400 J/m2 for disinfection have only a minimal detrimental effect on free chlorine (less than 5 percent). The ProMinent DCM controllers can be programmed so that, when water clarity is good and there’s little to no combined chlorine present, the UV system will run at 400 J/m2 for disinfection and cryptosporidium protection. When the DCM controller senses that chloramines have risen up to the setpoint, it increases the UV output to 600 J/m2 to break down the combined chlorine present in the pool. The new UV and water chemistry control systems, along with new chemical feed pumps, were installed in August 2013. Because a planned new construction project located adjacent to the natatorium will soon eliminate the only practical and safe route for bulk sodium hypochlorite delivery, the aquatic facility also switched from using sodium hypochlorite (commercial bleach) to a new dry calcium hypochlorite tablet system for on site chlorine generation. Since the new UV and water chemistry control systems have been installed, the water chemistry in the Fishers Aquatic Center Pool has remained in proper balance. The formation of chloramines is now being prevented due to the optimized and controlled rate of UV and chlorine dosing. Continuously clean air is now standard at the facility, and chloramine levels in the pool water typically run less than 0.18 ppm. According to Coach Chambers, the pool is now a much better place for his swimmers to train and compete. In addition to using the secondary oxidizer, UV, for disinfection and chloramine destruction, the ppm chlorine dosing strategy provided by the DCM-502 control systems also saves on chemical use. “We’re running our chlorine at about 20 percent of what we used to,” says District Pool Operator Bill Wolf. There are also soft cost savings gained, including less man-hours required to dose bicarb in the water and for manually adjusting pumps to prevent over- and under-dosing events. By switching water chemistry control systems, the Fishers Aquatic Center has also added mobility to its pool water chemistry monitoring and control. The system provides for standard webbased, real-time monitoring and control via a network-enabled PC, smart phone, iPad or other tablet device. The ProMinent DCM-502 is also designed to control the pool’s backwash and filter operations, although the school has not yet included those functions in its operations. Wolf says he wants to become more familiar with the pool’s new water chemistry control systems before beginning to use more of its advanced functions. With the success of the new water chemistry disinfection and control equipment at the Fishers High School Aquatic Center, the district is planning to install the same equipment at its Hamilton Southeastern High School swimming pool. In 2014, the district is expanding that school’s 25-meter indoor pool to a 50-meter competitive pool. “Based on the outstanding performance of our new system at Fishers, it just makes good sense to have the same equipment serving our Hamilton Southeastern High School pool,” Supervisor Taylor says.